I’d like to take this time to brag about my best friend, RB. He’s a wonderful dog who is a clown when I need to laugh, a protector when I need protecting, and a huggable bundle of fur when I feel like crying, but most of all devoted friend. He is always willing to help me out. When I was diagnosed with MS, bad knees, and bad hips a few years ago, RB took on a new job in addition to all his other endeavors. He became my therapy dog. He pushes me to get up and keeps me moving when I should but also makes me take it easy when I need to rest. RB learned long before I did when I was going to have a bad MS episode and would growl until I sat down. He is always right beside me when I am doing my physical therapy. He learned to shut doors and bring me things when I could not get up. He would curl up next to me after I had my joint injections careful to be near but not so close as to cause me more pain. He never once complained when we ran agility on crutches or with leg braces. We even tried it on a scooter a few times when the mean, evil doctors wanted me to stop running. RB has been an outstanding agility partner. He has been there for me through my good handling choices and my bad ones, never once blaming me or complaining. 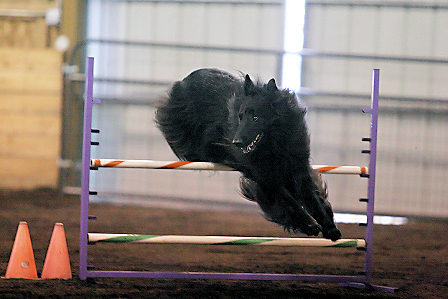 He has told me in so many ways that he loves doing agility, but being with me is more important. RB is not only my first Belgian but also my first competition dog. 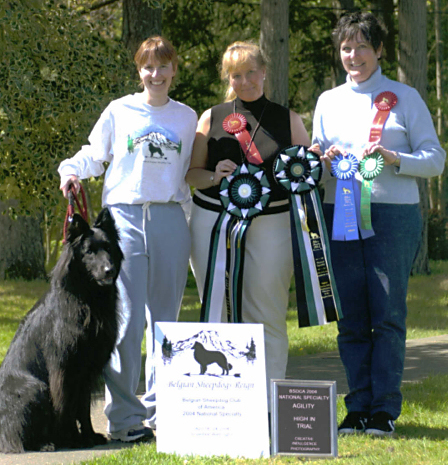 Together we have learned how to do agility, obedience, herding, and even free style. RB has a wonderful work ethic and try’s his very best no matter what the task. He will work for cookies, toys, and most importantly because he wants to please me. I was so lucky when I got RB because with him came a great friend in Jill Miller. Jill was willing to take a chance on a first time Belgian owner and give me her pick stud fee puppy. Jill has always been there for us both with a kind word and lots of advise when needed. She showed RB to his AKC conformation championship, as I was not graceful enough to achieve it. I would also like to thank Teddi Gill for breeding such a fine animal. I would also like to thank the many trainers who helped RB and I. along the way; Dawn Jecs, Cheryl Sackmann, Lisa Ross, Joe Kapelos, Gillian Crawford, Diana Hoyem, Nancy Baer, Joyce Beithanseto, Pam Buck Gail Sackett, and Carla Mcallister. I also have to send a big thank you to Dr Ghislaine Robert for her medical advise and treatments that made this successful year possible.